Note the aft gantry carrying the solar panels and wind generator. There's also a sturdy little fibreglass tender mounted on the foredeck which we raise and lower with the spinnaker halyard and mast winch. The engine room looks busy but is in fact accessible for all the key maintenance requirements. 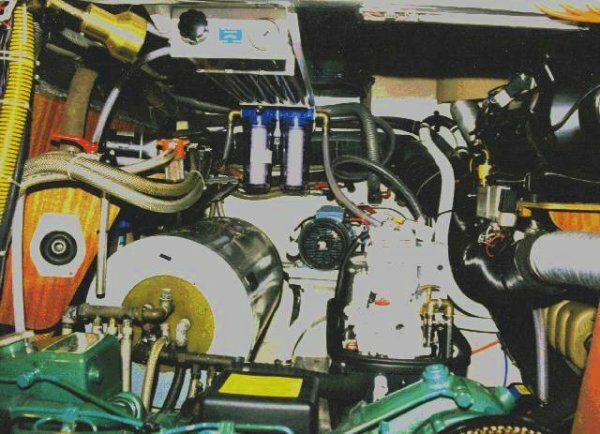 In the foreground in green is the top of the Volvo TMD31B, 92hp, main diesel engine. The cylinder to the left is the hot water tank, heated by the engine or an immersion element. The white object to the the right of it is the 4KVA Dolphin diesel generator set that produces 240v, 50Hz power. Roughly in the centre is the high pressure pump that feeds sea water at around 1000psi into the three black, semi-permeable membranes at the top of the picture, that convert oggin into extremely pure water. The black thing on the RHS is the central heating unit which we don't expect to get much use from where we intend going. If that looked busy, control central looks even more confusing. 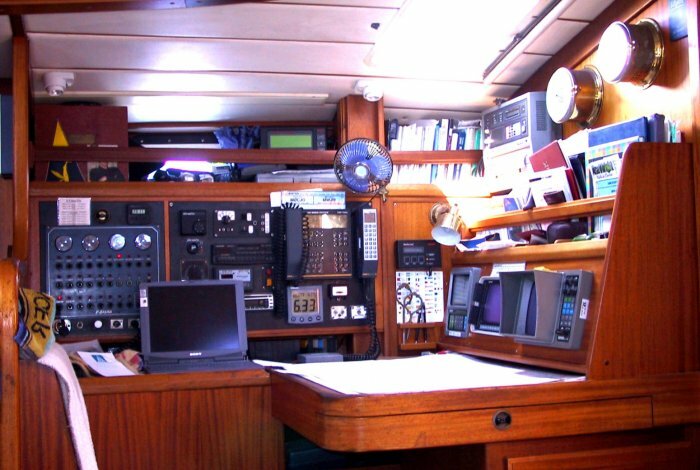 The screens on the right are; GPS (one of three), chart plotter and radar. At the back are the radios (HF, VHF, broadcast with tape and CD players plus audio amps and distribution). On the LHS are all the switches to control lights plus all the other functions. A key requirement is to maintain our batteries in good condition with a high state of charge. To do this we monitor both 12v (330AH) and 24v (160AH) with a sophisticated Link 20 computer system. A patchboard enables the two 12v solar panels to be used in parallel on the 12v bank or in series on the 24v supply. It also enable the panels and wind generator to be connected across any batteries on board. Additionally we can charge from the two alternators on the engine or from battery chargers when the generator set is running. 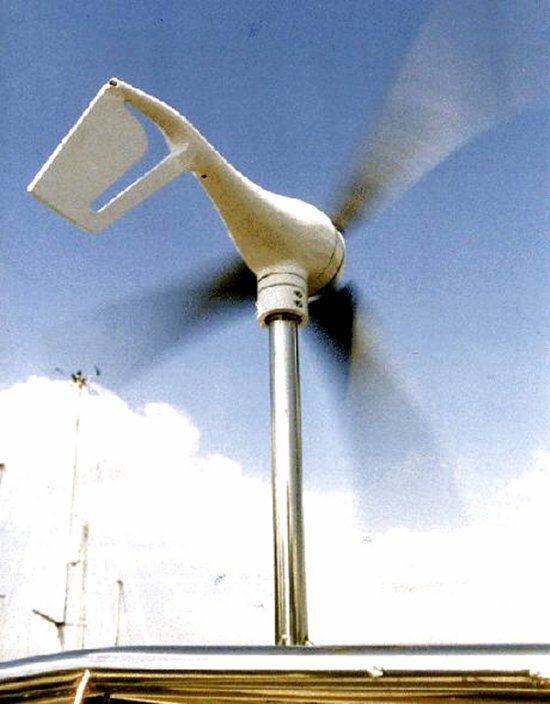 Given a good wind (25kts) this posy looking wind generator from Arizona is capable of pushing out 26amps. We are heading for La Corruna on the north west coast of Spain. If conditions permit we will go direct but otherwise a stop off in Camaret, near Brest would be welcome for a fruit de mer in our favourite restaurant and a chance to stock up on Gallic specialities. From there we head south, around Finisterre to the Rias of Galacia. This is a remote area of long inlets with small fishingvillages and excellent sea food. Then we amble down via Lisbon and the Algarve to Gibraltar, then via Madeira to the Canary islands. We plan to be there around mid-October and will leave to cross the Atlantic to St Lucia on about the 20th November. We should be downing our first rum in the Caribbean around the 14th December..